An ion is an atom or group of atoms carrying positive or negative charge. Example Ca2+, O2-, SO42- etc. If a particle has equal numbers of protons (+) and electrons (-), the particle charge is zero, and the particle is said to be neutral. In a chemical reaction, electron(s) can be transferred from atom to another atom. 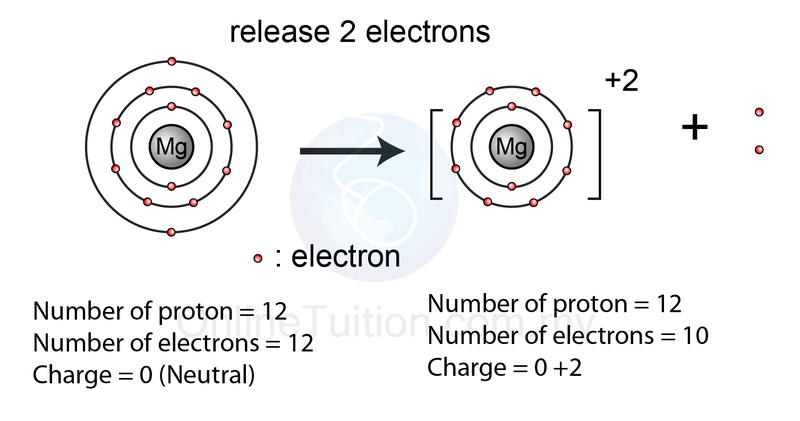 If electron(s) is removed from an atom, the number of protons will be more than number of electrons. In this case, the atom will has excess positive charge and hence form a positive ion (cation). If an atom gains electrons, there is an excess negative charge in the atom, so a negative ion is formed. The atom losing electrons forms a positive ion (cation) and is usually a metal. The atom gaining electrons forms a negative ion (anion) and is usually a non-metallic element. Usually, the atom of metals consist of 1, 2 or 3 valence electrons. 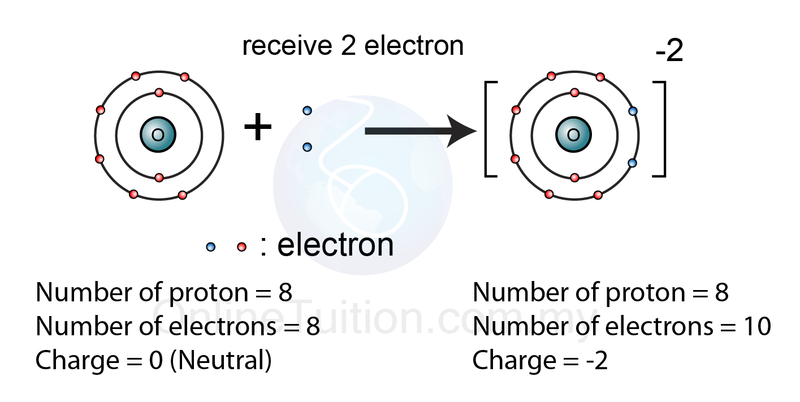 In order to achieve octet electrons arrangement, the atoms will release the valence electrons. After releasing the valence electrons, the protons in the nucleus will out number the electrons. As a result, positive ions formed. Negative ions are formed among atoms of non-metal elements except group-18 elements. Non-metal elements usually located in group 15, 16 and 17 in the periodic table and have 5, 6 or 7 valence electrons. 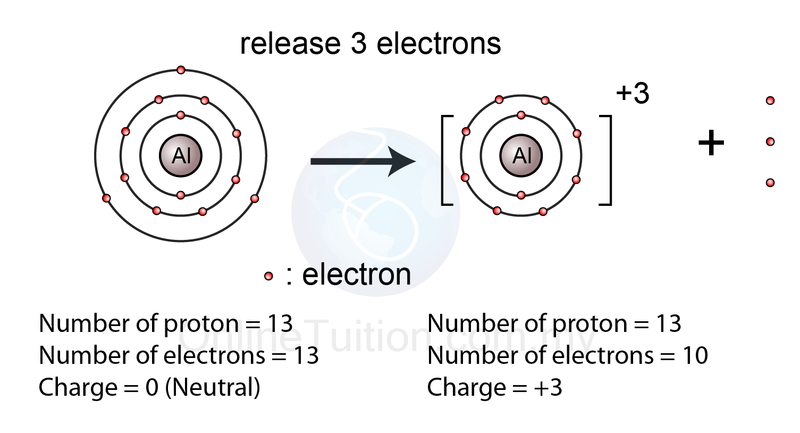 To achieve octet arrangement of electrons, their atoms will receive 3, 2 or 1 electron. As a result, the electrons will out number the protons and hence negative ions formed. After forming an ion, the electron arrangement of the ion is similar to the noble gases. For example, the electron arrangement of fluoride ion is 2.8 which is similar to a Neon atom, 2.8. 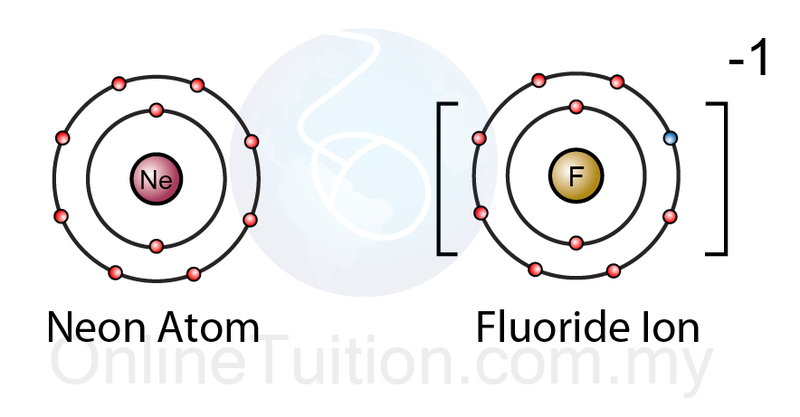 Fluoride ion and the neon atom have similar electron arrangement. Fluoride ion carries charge whereas neon atom is neutral.